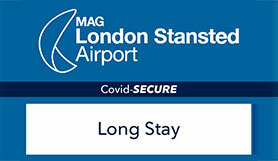 Stansted Official Long Stay Parking is perfect for peace of mind and complete control. Simply park your car, keep your keys and it’ll be safe and sound in the same space when you return. It’s an official onsite service that’s open 24 hours / 7 days and accredited by Park Mark thanks to security features like CCTV, robust fencing and regular foot patrols. When you arrive, an automated number plate recognition system smoothly raises the barrier. Free and frequent shuttle buses get you to the airport in 15 minutes flat. It’s suitable for Blue Badge holders and easy to find via major routes from London and Cambridge. Set your Sat Nav to Long Stay Car Park, Stansted Airport, Essex, CM24 1SF. Stansted official Long Stay Parking is only available if you book ahead — but you can easily arrange it online in a couple of minutes. When you want to park with confidence, keep it official. Previously operated by Meteor under the Pink Elephant® brand, this car park is now called Stansted Long Stay and is operated by Empark.